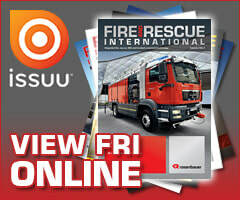 Fire and Rescue International (FRI) is an independent technical magazine that has fire management and suppression, rescue, emergency services and incident management as its core focus. The magazine strives to keep a balance between the various sectors that it serves so that each area of expertise is covered on a monthly basis. By doing so, the magazine has become a sought-after publication to which the decision makers in this closeknit industry have subscribed. The main objective of this niche market journal is to raise awareness of new technology, local and international, in depth research projects, legislation and relate industry news and events to our readers. The magazine not only creates an active marketing platform for suppliers to the fire fighting (structural, industrial, ARFF, wildland and forest, petrochemical and marine fires) technical rescue (USAR), high-altitude rescue, mountain search and rescue, EMS, Hazmat and incident management industries, but also acts as a communication forum for this close-knit fraternity, bridging the gap between the urban-wildfire interface and addressing the challenges of the urban-industrial interface. 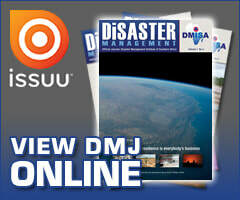 Disaster Management (DMJ) is the official journal of the Institute of Disaster Management Southern Africa. The journal enhances DMISA’s role in advocating international disaster management best practice, nurturing a culture of disaster risk reduction and fostering national and international communication networks and linkages. DMJ also serves as a valuable resource for information and knowledge dissemination, education and training to not only proactively reduce disaster risks but also the efficacious management of disasters. The magazine will also promote the Institute: national and regional DMISA news and all disaster management related topics, events, conferences and disaster risk reduction initiatives. The articles featured in this quarterly magazine include forwards from the President of DMISA, Mduduzi Lancelot Nxumalo and Dr Mmphaka Tau, Head of the National Disaster Management Centre (NDMC). Each edition will feature a disaster management centre, research articles, industry opinions and viewpoints, technology updates and a news roundup. The 12th Fire Management Symposium hosted by the Nelson Mandela University included a filed trip to the Knysna fire area and the recently established Denneoord airstrip in George. The video showcases the Working on Fire/Kishugu Aviation aerial demonstration.